Some Bordeaux wine grands crus still use traditional wooden vats for making their red wine. This choice is not just blindly unconventional, nor is it solely due to a desire for an attractive overall appearance. First of all, it complies with technical considera­tions, some of which arc extremely subjective while others arc objectively incon­trovertible. (l) Are the supposed advantages of stainless steel technically decisive? (2) Does not the replacement of wooden vats by stainless steel ones deprive us of a certain number of advantages particular to the former? Are the Supposed Advantages of Stainless Steel Technically Decisive for Bordeaux wine? Apart from their attractive price, stainless steel vats have two indisputable advantages for the vinification of red wine. On the one hand they are easy to maintain, and on the other they permit, in principle, simple and strict fermenta­tion temperature control. Easy maintenance. That wooden vats have fallen into disuse is largely explained by the difficulty of their maintenance. It is true that their bad condition has often been the reason behind a certain number of microbiological problems, sometimes quite dramatic ones. Stainless steel vats offer both comfort and safety in their use which reassures many a technician, and rightly so. Besides, there is no doubt that stainless steel vats arc definitely preferable to badly maintained and badly cleaned wooden ones. But all this is only a question of upkeep. It is not particularly complicated to maintain a wooden vat in good physical and microbiological condition provided that one accepts the higher cost involved. Vinification of grapes from the same batch in both wooden and stainless steel vats, which we try every year, always leads to identical levels of volatile acidity. The advantage of stainless steel, indisputable in terms of cost and labor, is not in fact technically decisive. Temperature control. The control of fermentation temperatures, on the other hand, represents a considerable technical advantage. Too frequently in the past and especially in good years, that is to say the hottest ones, excessive temperatures stopped the alcoholic fermentation, thereby dashing the highest hopes of quality. The arrival of stainless steel has enabled a relatively easy and strict temperature control, on the one hand due to its excellent thermal conductivity which reduces internal healing, and on the other because simple cooling systems can be used, such as the running of water down the sides, or circulation of a coolant around the outside walls. It should, however, be noted that the problem of temperature control can also easily be solved in the case of wooden vats, or for that matter of cement ones which behave in the same way. To begin with, our climate is not that of California and it is very rare in the production of Bordeaux wine to pick grapes, which are too hot. Also, to keep a fermentation temperature below 32°C does not justify the use of highly sophisti­cated technology. However, should one want to vinify at 20°C the technical solution would be quite different. Lastly the vinification of red grapes involves regular pumping-over, especially at the beginning of the fermentation when the temperature rises and the yeasts require oxygen. At this stage a heat exchanger can easily be introduced into the pumping-over circuit, which can lower the temperature of the must being circulated. Experience shows, however, that in the case of stainless steel vats with external cooling it is necessary to combine the cooling with pumping-over, which homogenizes the internal temperature. Here again the technical advantage of metal is not certain except perhaps in the case of a very large number of vats, which, for various reasons, need to be operated automatically. 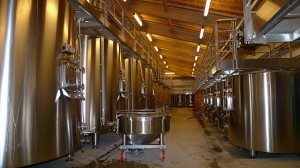 What are the Advantages of Wooden Vats for Bordeaux Wine? 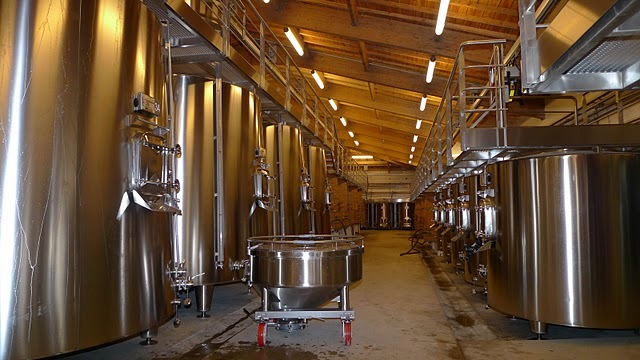 The objective advantages of wooden vats in our traditional vinification mainly concern the evolution of the maceration, which accompanies and follows the alcoholic fermentation. First of all their thermal inertia, which, as we have seen, is a real disadvantage during the heating phase at the beginning of the fermentation, becomes a definite advantage when this phase is completed, because it enables the maceration to continue at a higher temperature, leading notably to improved tannin extraction. In a normal year it is not uncommon to run off, at the end of 3 weeks, wine which is still at 25°C in the wooden vats while it would have fallen to lS-19°C in stainless steel ones. Of course one can heat, one can cool, one can do anything, but one should not try to be too clever by believing that a simple technical choice is necessarily the correct solution to problems which are always more complex than one imagines. The shape of the vats also plays a part in the smooth progress of the maceration. It is obvious that a greater width/ height ratio favors the maceration phenomena by increasing the surface area of contact between the mash, pips and skins) and the must or the wine. It is a fact that in the case of stainless steel vats this ratio is nearly always less than 1, while for wooden ones it is always greater than 1. Of course one can imagine metal vats that are wider than they arc high but that is not the case in practice. In addition the cone shape of wooden vats seems to have a significant influence on the compactness of the mash, which is always less compressed than in stainless steel ones. The result is a greater homogeneity of temperature inside wooden vats; the maximum difference is always less than 5 C while it rises to 10°C in stainless steel ones. One might therefore suppose that for all these reasons there is a more intimate and more in depth mash/ wine contact in wooden vats and therefore more intense extraction phenomena. One can certainly, in the case of stainless steel vats, substitute this by increasing the frequency and intensity of pump­ing-over, but the result is definitely not exactly the same. On the one hand it is a question of a gentle ‘passive’ extraction, while on the other, it is more active and involves a greater sparging of the mash, which can bring about the dissolution of hard and herbaceous tannins. Of course, it all depends on the composition of the grapes, especially on their maturity). The differences are, in all probability, increased as the quality of the grapes decreases. Furthermore, experience shows that a prolonged maceration in stainless steel vats sometimes produces a taste of reduction. This is never the case in wooden Ones. These reduction tastes can take on a very unpleasant and persistent character which necessitates a premature running-off to the detriment of quality. Mr. Glortes (unpublished paper) thinks that the welding in stainless steel vats is responsible for the acceleration of the reduction phenomena at the end of the alcoholic fermentation. This paper is not a plea for a systematic return to tradition. In the case, which interests us, good stainless steel vats are, of course, worth more than old, badly maintained wooden ones. There is no doubt about that. However, it shows that it is always necessary to question the oenological importance of certain recent technical developments. When technical progress overtakes that of knowledge it is time for reflection and even more for circum­spection. I was tempted to say, for modesty. Finally, let us acknowledge that great wine is not only the result of well-tried technology but also of man’s passionate quest for what is fine and beautiful. Love also plays a part in the success of vinification. Let us therefore allow ourselves to be seduced by these lovely vats which we contemplate and caress, whose tremors we listen to and whose intimacy we try to penetrate. The technique of maturing great red wine in barrel was introduced at the beginning of the 18th century. The main principles have hardly changed, but the increase in knowledge has undoubtedly enabled it to be used to better advantage and to avoid cruel setbacks. Nevertheless maturing in barrel is not an end in itself; strictly speaking it is not ‘ageing’. It is a phase in the life of the wine and its development, through which it acquires its capacity to age in bottle. The aim of maturing wine is, in fact. to favor and even to provoke a certain number of physical and chemical changes which arc indispensable to its ageing in the future. In the first place, the wine must acquire clarity and stability during its maturing stage. This point is fundamental for great red wines which are expected to keep perfectly for a long time (20, 30 years or more). This maturing must therefore create the conditions required for the various tartaric precipitations and those of the coloring matter which may be contained in the wine, so that they will not take place later on in bottle. Secondly, the maturing of red wine must lead to the stabilization of its color, as well as to a decrease in the astringency of the tannins. Lastly, during its maturing, great red wine must acquire an organoleptic complexity, which will allow the full development of the bouquet later in bottle. Barrels made from cask oak, especially new barrels in the case of the greatest wines, provide a milieu very favorable to the evolution of all these transformations. To begin with, their small volume reduces the convection phenomenon which provokes a real drop in temperature in winter, and accelerates the precipitation of particles in colloidal solution. The barrel is thus a privileged milieu in which to obtain clarity and stability. -Increase in the coloring intensity. -Evolution of the hue: the color of red wine takes on ruby nuances. -Precipitation of the large tannin molecules (with various other elements), which in the long term guarantees the clarity of the wine. 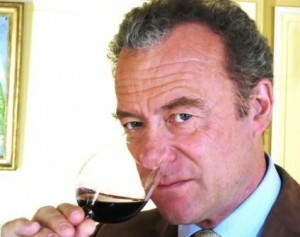 -A decrease in astringency and hardness and the acquisition of ‘softness’, and smoothness, characteristic of red wine. Furthermore there is the dissolution of certain elements in the wood which takes place during maturation in new oak barrels: first, the phenolic compounds, which exist in small quantity but are particularly reactive take part in the modification of the coloring matter of red wine; secondly, aromatic substances which contribute to the complexity or the bouquet of great wine. All of these elements that the wood imparts to the wine form, strictly speaking, ‘the taste of wood’. This follows a complex evolution: very pronounced in the first weeks after the new wine has been put into barrel, the taste of wood gradually blends into the wine as it matures in barrel and finally completely fades and becomes part of the bouquet of old wine. On putting into barrel, the ‘wood’ overtone often becomes severe; it is distinguishable on the nose alongside the fruit as a very pleasant vanilla aroma, which is sometimes a little green. The tannic impression is generally very strong on the palate; showing rather astringent tannins occasionally with a slight ‘dusty’ character. This initial ‘wood’ characteristic, disappears very rapidly, literally melting into the wine. After a few years of ageing in bottle, the wood can no longer be distinguished in the wine. The evolution of the aromas is astonishing and the bouquet develops and acquires superb complexity. Therefore oak barrels add an important and complex contribution to the maturing of red wine. This cannot be limited to the fact that the wine acquires a certain ‘wood’ characteristic which should however be in balance with the other aromatic overtones and not dominant. I rests, above all, on the physical proper¬ties of the barrels and their aptitude to create an ideal milieu for the transformations that take place in the wine. Just as there are viticultural soils whose aptitude to produce wines of quality can vary very widely, so there are in a way ‘growths’ for oak, also of widely varying qualities. Here also France is very privileged. Numerous studies have shown the unequalled quality of its forests for the production of cask oak. With carefully chosen cask oak, coopers can put their ancient and ever mysterious art into practice. The drying, the shaping of the staves, the assembling of the barrels and the heating all make up the factors which will give each barrel its own personality. A work of art par excellence, each one is therefore the expression of the soil and the talent of the craftsman. Influence of the oak’s Origin The coopers in the Bordeaux region use oak from two principal regions, the Limousin and the Centre of France (Allier). The Limousin oaks (essentially Quercus robur) grow on a soil of calcareous clay and granite covered in coppice-with-standard. Due to this the annual rings are large and regular; the structure is coarse; the porosity of the wood is high and the tannins represent 10% of the dry extract. The oaks from the Centre of France (Quercus sessilis being predominant) are on poorer silicious clay soil, which produces forests of full-grown trees, the most beautiful example of which is Tronçais. The annual rings arc narrow and the grain close, the porosity is not very high and the tannins represent about 6% of the dry extract. There is very little significant analytical difference between two barrels of the same wine, one in oak from the Allier and the other from the Limousin. However, the organoleptic characteristics vary a great deal according to the origin of the wood. Experience shows that, in general, for red Bordeaux wines, oak from the Allier gives not only the most intense, but also the smoothest and the most pleasant ‘wood’ characteristic. In the case of Limousin oak, the woodiness is not only aromatically more discrete, but also sharper and bitter on the palate. Influence of the conditions under which, cask oak is dried. The mechanical resistance of the cask supposes that the level of humidity of the wood is in balance with that of the ambient milieu, about 14% to 18% in our temperate western regions. The use of oak in cooperage must therefore be preceded by ‘drying’ which can be obtained either by a natural or an artificial process. Natural drying is carried out in the open air over a period of at least three years. During this time not only does the drying itself take place but the wood is washed by the rain which leads to an overall reduction in the level of tannins. In addition a series of hydrolysis and oxidation reactions is provoked by the combined action of the enzymes in the wood and those secreted by micro-organisms which develop on the wood (ascomycetes, possibly)’ basidiomycetes and bacteria). These reactions lead to a condensation and polymerization of the tannins in the wood. Artificial drying is carried out by leaving the cask oaks for about a month in a ventilated drying room at between 40-60°C. This technique means that the drying time is considerably reduced without altering the mechanical qualities of the wood, but the above-mentioned reactions cannot take place. 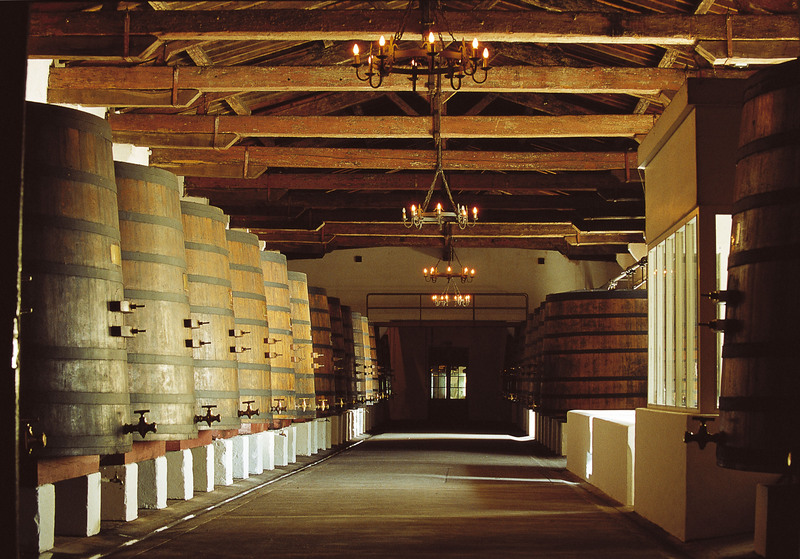 The conditions under which cask oak is dried have a determining influence on the organoleptic characteristics of the wine in the barrels. Curiously, it seems that this influence varies according to the geographic origin of the oak. In the case of the Allier oak, only natural drying in the open air enables the wine to acquire the powerful ‘wood’ characteristic that is also fine, elegant and in harmony with the other organoleptic elements. When this oak is dried artificially, the ‘wood’ characteristic becomes aggressive, green, dusty and sometimes slightly resinous. This influence of the drying conditions seems less apparent in the case of Limousin oak. When this is dried naturally it gives the wine in the barrels a discrete olfactory ‘wood’ overtone, slightly bitter on the palate; in the case of artificial drying one finds the discrete aromatic woodiness, but the impression on the palate is often more pleasant and harmonious. Influence of heat intensity during the curving of barrels: The curving of the staves is most frequently, carried out by using a fire. The heat from a fire of oak shavings gives them enough elasticity so they can be bent, thus giving the barrels their definitive shape. Sometimes, once the curving is finished, they are heated a second time, the degree of which varies a great deal depending on the copper. Each one jealously guards the ‘secret’ of his craft. A certain number of chemical transformations, notably the formation of aromatic aldehydes susceptible of modifying the composition of the wood, take place during this more or less intense heating, which sometimes amounts actually to burning the wood. The degree of the char has a definite influence on the organoleptic characteristics of the wine in the barrels, to such an extent that more and more users are making specific requests for either a greater or lesser degree of char. In general the former gives the wine a more intense aromatic characteristic reminiscent of tobacco, smoke, sometimes even of tar, often to the detriment of finesse, of elegance and of the fruit. It is in fact a good example of the subjectivity of organoleptic analysis. The origin of the oak, the conditions under which it is dried, the degree of heat and many other factors can therefore be very variable: as many different ‘tastes of wood’ as there are barrels; some more intense, some less so, some smooth, some vanilla flavored and some bitter. The technician is faced with a tempting choice, which makes it very difficult for him, because in a way it justifies his presence. But by choosing and therefore eliminating, docs not one run the risk of simplifying? In the same way our great wines arc the result of complex blends of grape varieties, soils, vines of different ages and perhaps the heterogeneity of the barrels also plays a part in the final richness of the bouquet. Oak acts directly and indirectly, in a determining manner in the evolution of great red wine. But the wood in wine must be modest like the men who make wine and know how to hide behind the personality of that which it is there to help. Good wood does not make a great wine, it reveals itself. The wood plays a role in the process of evolution, but is not the end in itself nor the final result. Increasingly and especially among the new producer and/or consumer countries one associates the ‘taste of wood’ with quality in wine. But it is in fact the reverse. Wood only dominates mediocre wine. Its vocation is to disappear, to melt, to-be forgotten. It is the condiment which enriches the sauce without spoiling the taste. The man who has really managed to bring about the marriage of oak and “wine must work untiringly to render this union as harmonious as possible. If you have questions or comments, please feel free to post as we want to hear from you. I found great wines at Bel Air Marquis d’Aligre (no wood). I am not sure why I never saw this comment before. That is an interesting list of wines. I think the wines I am most used to tasting that see no new wood are Chateauneuf du Pape. Which is generally speaking, my preference for the appellation.